The 2018 event was a fantastic success attracting over 3,000 attendees and we plan to make it bigger and better this year! 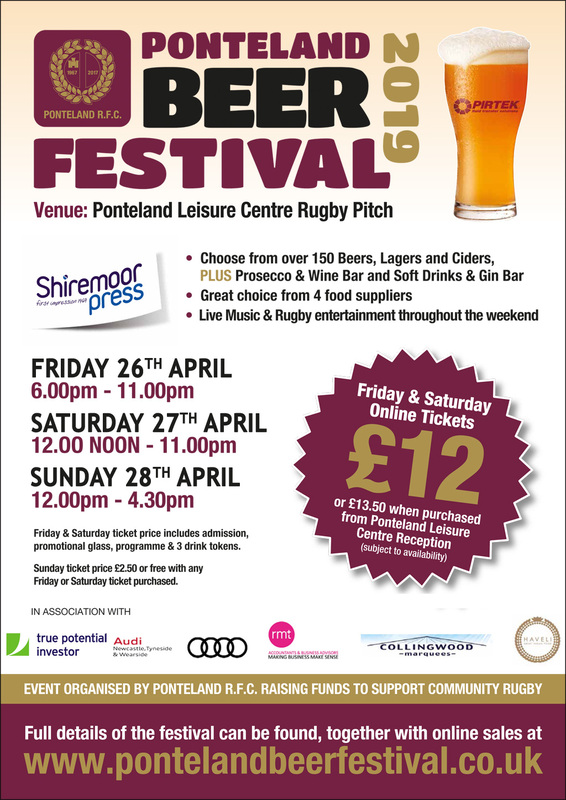 Over 150 Beers, Lagers and Ciders as well as Prosecco, Wine, soft drinks & a Gin Bar. A great choice of food. Fantastic music throughout the weekend. A Rugby match on Saturday and Fun Fair on Sunday. Friday and Saturday tickets prices include admission, glass, programme and 3 drinks tokens. Sunday tickets cover admission only. Note: Tickets aren't needed for kids. To obtain FREE tickets for Sunday, first order your tickets for Friday and/or Saturday and select a delivery option then click "Continue Shopping" to come back to this page to order Sunday tickets. The Sunday ticket price will be discounted on the final payment screen. Online ticket sales have now ended. TICKETS FOR SATURDAY ARE NOW SOLD OUT but there may be a few tickets for Friday night and Sunday still available at Ponteland Leisure Centre.